Seminyak is a popular beach resort town at the southern end of Bali, Indonesia. It is famous for its luxury hotels, spas and villas, high-end shopping, and superb cafes, bars, and restaurants. The wide, west-facing stretch of beach on the Indian Ocean is covered in soft, gray sand and is lined with modern bars and clubs. It is often full of surfers when the conditions are good. 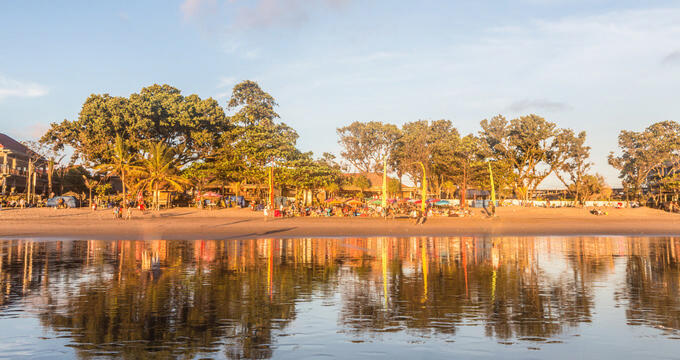 Seminyak is more relaxed than nearby Kuta, but still very lively, offering tourists great art galleries, excellent traditional food, and many tour agencies ready to show them the true Bali, in the jungle, across the rice fields, or at hot springs. Partying into the early hours while vacationing in Seminyak on Bali is on your list of things to do anyway, so why not do it with the help of local experts? The Bali Party Crawl Walking Tour will make sure you do not miss any of the hotspots such as the Single Malt Bar and do not have to wait in line. 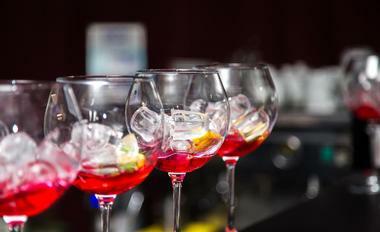 Local guides will take you on a walking tour of the four most popular bars and nightclubs in downtown Seminyak. Besides not waiting in line to get in, you will get four free shots and a significant discount on as many drinks as you want. The tour takes five hours and a professional photographer will come along to take photos of the group. 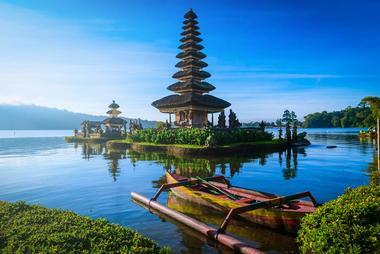 With so much to see in Bali, you really need help in deciding where to go and what you should absolutely not miss. Bali Natural Tours organize custom-tailored tours based on your own interests, making sure that you get the feel of the essence of Bali. There is large range of tours, such as the Safari and Marine Park tour, an elephant ride through the tropical jungle, a trip to Tanjung Benoa beach for parasailing, and much more. All tours include air-conditioned transport, an English-speaking driver and tour guide, Balinese traditional clothes, and bottled water. Lunch is not included in the tour price, but the guide will recommend a good traditional spot to stop for lunch. The tours lasts half a day and all guests are picked up at their hotel. 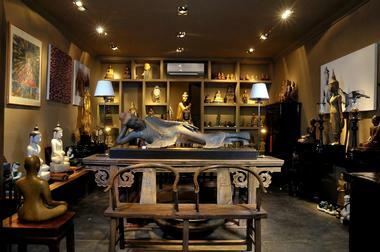 Bringing a piece of art as a souvenir from your trip to Bali is a must, but if you would like something of lasting value, you should visit Buddha Gallery in Jl Basangkasa in central Seminyak. The gallery specializes in authentic antique statues and sculptures of Buddha, ritual objects, and other antique religious objects from Thailand, Burma, China, Laos, and Japan. These rare antique art pieces have been sourced from private collections from all over the world. Part of the gallery’s collection comprises breathtakingly beautiful objects such as a Burmese alabaster Buddha from the 17th century, a standing Buddha made from jackfruit wood in 19th century from Laos, and much more. If you are not planning to spend a small fortune on one of the gallery’s precious pieces, don’t worry, you can still stroll through the gallery and enjoy their timeless beauty. Café Organic is one of Bali’s most iconic eateries. Their Petitenget location in the heart of Seminyak is incredibly charming, with marble table tops, spectacular living green walls, and the famous Garden Gangstas mural. The café offers vegetarian and vegan health-conscious meals prepared with fresh, locally farmed ingredients. They offer all-day breakfast and lunch, salads, and smoothie bowls. Their signature dish is the Acai Coco Bowl, which is served in a coconut shell. Breakfast Criminal is a more substantial meal, loaded with layers of ingredients and topped off with poached eggs. You can also get the veggie burger and all sorts of imaginative salads. You do not have to be a vegetarian to enjoy fresh, colorful, delicious, and filling dishes at Café Organic. If you are looking for a vegan spot in Seminyak and your partner is not too enthusiastic, go to KYND Community and you will have a convert before the meal is over. Located in the midst of buzzing downtown, colorful and cool, KYND Community is the place to go for a fantastic morning coffee, a healthy salad lunch, an afternoon snack, or a great sandwich. Some of the dishes you have to try are the Berry Tropical smoothie bowl, the gluten-free gourmet toast with beet hummus and smashed avocado, the Coconut Piccolo cappuccino, the KYND Cheese Burger, and their fantastic waffles. Everything is plant-based and it is absolutely delicious. One of the most respectable galleries in Seminyak, Purpa Fine Art Gallery offers a large collection of contemporary art by Indonesian artists as well as those from different countries who decided to make Bali their home. The gallery aims to represent both established, renowned artists and those who are just emerging. The beautiful modern gallery is covered wall-to-wall with magnificent art, traditional and contemporary and quirky. Some of the artists represented by Purpa Fine Art Gallery are known all over the world, such as Walter Spies, Hans Snell, Antonio Blanco, and many others. 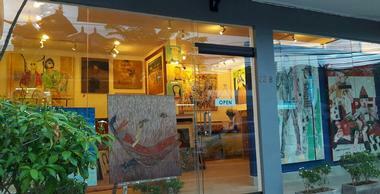 The gallery supports the artists by showcasing their art throughout their career, making their art accessible to a large number of people visiting Bali. The artwork ranges in prices, so there is something for any budget. Prints are available as well, more affordable and easier to put in a suitcase. True Bali Experience is a local family-owned tour company that has been introducing tourists to the magic of Bali since 1995. Whatever is your interest, they will put together a customized tour and take you around this magical place in complete comfort. 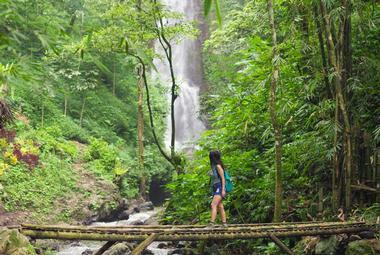 If exploring the tropical rain forest of Indonesia is what you dream of, join their Rain Forest Trekking tour, where an air-conditioned vehicle will take you to the spectacular highland rain forest overlooking the scenic lake-side village of Bedugul. Once you leave the vehicle, you will start a fairly moderate trek through a pristine, beautifully conserved lush tropical forest. While you enjoy breathtaking vistas, your expert guide will share with you the details on the unique ecology and wildlife of the jungle. The trek continues with a traditional canoe trip across beautiful Lake Beratan. Colorful, charming, and spacious, Revolver Espresso is an Australian-style coffee shop in Seminyak that has developed a reputation for the best coffee in town. They import some of the best beans from all over the world and roast and blend locally in Bali. Revolver Espresso is the perfect fusion of Melbourne’s cosmopolitan coffee scene and Bali’s charm and relaxed spirit. With your great coffee, you can get an equally delicious classic brunch such as smashed avocado with house-made muesli with coconut and goji berry, or traditional Aussie Grassy Knoll – a breakfast salad with local greens, beetroot, halloumi, quinoa, and soft-boiled eggs. The lunch menu features everyone’s favorites – burgers, sliders, salads, and shared plates. Try The Godfather – a breakfast burger with layers of hash browns and bacon. When visiting such rich and exciting places as Seminyak, you are always short on time to do everything on your list. If after all the sightseeing and partying you wish to be a little more active, join one of the Rural Bali Mountain Bike Tours and explore Bali beyond Seminyak while getting in a bit of exercise. They provide an English speaking guide, a well-maintained bike, a helmet, and an interesting and exciting route, mixing on-road and off-road trails and a single narrow track between the rice fields. One of the most popular routes is the 14-mile (22 km) Semer Loop route, a ride between green rice fields, stunning villas, and quaint little cafés, only about 1- minutes from Seminyak’s busy center. Seminyak Tour Driver is one-stop provider for your tour and transportation needs in Bali. With 48 local highly qualified and experienced drivers and guides speaking a range of foreign languages, they promise an unforgettable adventure during your stay on Bali, with a range of tours to choose from. One of their most popular and most comprehensive tours is a whole-day Bali Swing Ubud Hot Spring Tirta Empul Waterfall Tour. In only one day you will be able to visit Tegalalang Rice Terraces, Batur Volcano, Toya Devasya Hot Springs with its healing waters, Temen Village Coffee Plantation, Tirta Empul Temple, Tegenungan Waterfall, and Barong and Kris Dance. The lunch, which is not included in the price, is offered in a restaurant overlooking the Batur Volcano and its lake. A melting pot of cultures, with added Chinese, Indian, Middle-East, Dutch, Spanish, and Portuguese influences, Indonesia offers an incredible variety of authentic foods. Good Indonesian Food specializes in tours that tell the story of the country’s culture and history through its food. If you are staying in Seminyak, take advantage of the Seminyak Elevated Food Tour and enjoy spending 4 hours in the evening tasting delicious local specialties. You will visit four places for dinner and try eight or nine different dishes, including an appetizer, main course, fish soup, steamed vegetables, pork ribs, and a traditional dessert. Your local guide will help you understand the foods you are eating as well as the ingredients and their preparation. You will be so full it is good that your guide will drive you back to your hotel. If you stay in Seminyak long enough, you will start craving less exotic and more familiar food. 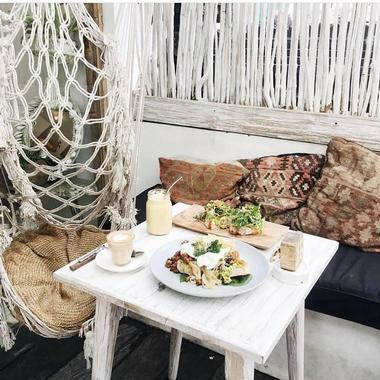 Sisterfields brings a dash of Australia to Bali, with your favorite latte and pancakes, salads and burgers. Bright, modern, and spacious, Sisterfields is pleasant and comfortable, indoors and outdoors, with a magnificent wall of greenery to remind you that you are in the tropics. It is the place to be in Seminyak for brunch or lunch, to see and be seen, and for ever-popular people-watching. It is almost always packed with locals and tourists, lively and noisy. Besides excellent coffee and fresh juices, you can get all sorts of salads and burgers, pancakes with berry compote and vanilla ice-cream, and a whole range of egg dishes including the classic eggs Benedict. SOUQ Organic is an elegant combination of a healthy café and a lifestyle and clothes store in the heart of Seminyak. 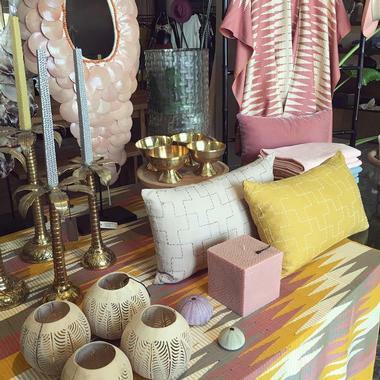 Modern tables are placed amongst beautiful dresses, beach accessories, and home decor and it is difficult to decide what to do first – look at the clothes or get a piece of their famous carrot pie. The spacious, modern room has a very calm vibe, with soft music and attentive staff to let guests enjoy their coffee or browse their clothes without being rushed. When it comes to clothes, SOUQ combines Old World crafts and classic materials, creating a new sophisticated style, traditional and modern at the same time. SOUQ is known for the best coffee in Bali and for its organic fresh-baked cakes, pies and tarts, organic salads, and toasted sandwiches. All their fruits, vegetables, and meat are organic, ethical, and sourced from local farmers. Located on the rooftop of the quirky, modern Dash Hotel, The Shack is one of the best rooftop bars and restaurants in Seminyak. The colorful and laidback lounge bar and sundeck are popular with both locals and foreigners as a spot to hang out and watch the sunset and the city panorama. The Shack has an extensive list of classic and modern cocktails, a small but well-chosen wine list, and just about anything else their guests might desire. The menu is extensive and has a bit of everything, from pizzas and salads to burgers and slides. The small but exquisite Bites are the best bet, with such delights as Peking duck flatbread or confit duck Scotch eggs. Wave House Surf School is one of the most reputable surf schools in Bali, with a team of highly trained and experienced surf instructors. They work both with the beginners and intermediate surfers, regardless of their age. The surf school is located in Kuta, about 50m from Kuta Beach, in front of one of the best spots for beginner surfers in the world. With soft waves and a sandy bottom, the first lessons are safe and pleasant, ensuring a successful training and new love for the sport. 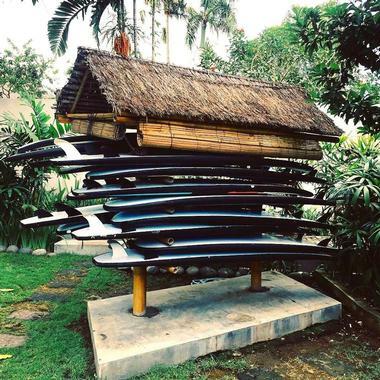 For the more experienced surfers ready to surf the reefs, Wave House can organize a surf trip to one of the most popular spots anywhere on Bali. There is a free pickup from Seminyak and other places on the island. Surfboard rental for the whole day is included.